If I could use one word to describe this book it would be thorough!Â Making Polymer Clay Beads Â by Carol Blackburn is jam-packed with easy toÂ follow projects.Â There are tips at every turn, showing you not only how to make a wide range of beads, but the ins and outs of how to make them more uniform and professional looking.Â I’ve been making beads for 15 years and found a few useful tips that I hadn’t heard of yet! 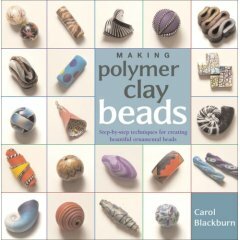 You’ll find a complete collection of the basic polymer clay techniques.Â While nothing is explored in great detail, it’s the perfect jumping point before you start exploring on your own. This is a perfect book for beginners, it reminds me of a great cookbook filled with classic recipes along withÂ tried and true tricks to make creating accessible for everyone. That was pretty much my exact take on the book! Lots of good, useful information, quality photos and simple, basic bead building techniques. A good primer. great to know that even pros can learn from another. I agree with everyone of your comments. I just love this book and I don’t make jewelry! I was looking for a clay book and I found this one. It does cover the basics and for one who isn’t too experienced with clay, it helped me alot. Lots of good color pix. Just a nice book all the way around. Rosanne, I thought of you when I was reading this book!